This world is full of mysterious and interesting things. It seems no matter where we go or how far we travel, something strange and wondrous is waiting to be found. Below you will find some of the most ‘weird’ places on Earth and what we know about them. Most of these places you probably have never heard of but will most likely want to visit (if you still can, some of these places are no longer standing or off limits). While some of them are natural, others are man-made. Which place would you go see if you could pick only one? Let us know, my favorite is number 7! Some call this place the world’s largest mirror, it is a huge area of salt flats. This place contains almost 70 percent of the world’s lithium and is a sight to be seen. You really would never fully understand it until you experienced it firsthand. 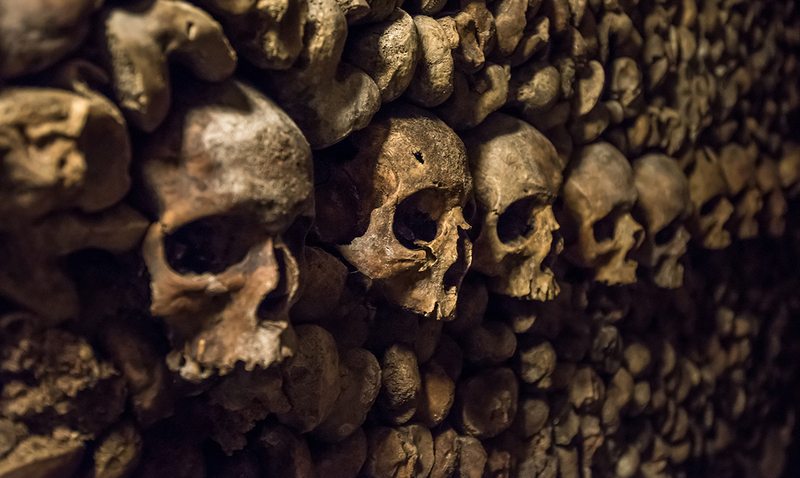 There are thousands of people buried here, beneath the streets of Paris. It was created in the 18th century to help with the overflow coming from cemeteries and is super creepy and yet interesting. The Catacombs are quite intense and if you do not know your way around you will get lost and most likely die down there. This is a beach is covered with a type of seaweed that is called Sueda. This seaweed turns bright red in the fall and gives off a very interesting look. It almost looks as if you could walk over it as if it were land but it just doesn’t work that way. This one is a bit peculiar, to say the least. The landscape itself is one big optical illusion. The downward sloping roads appear to slop upwards. This creates what is known as a rolling uphill sensation and might be more than enough to make you nauseous. Just outside of the town known as Antofagasta the shattered remains of what looks like a buried giant hand reaching out. This hand is about 36-feet tall and sticks out of the sand. It was sculpted many years ago and is quite a wonder to see. This island is also known as Isla De Las Munecas. It is an ‘uninhabited’ island that is filled with tons of rough looking dolls hung literally everywhere. The only person who lives on this island is said to have hung them. This island was dedicated to the lost soul of a poor girl who passed away mysteriously and was found drowned. Legend says the dolls move their heads, arms, and some even open their eyes. This is what you would truly call a bloody lake. It is a shallow salt lake. The reddish color is because if the sediments and pigmentation of some algae living there. It looks like tomato soup but I am sure is not quite as yummy. This beautiful lake can be deadly as it is frozen but still flammable. It has bubbles of pockets of methane in it. Methane bubbles form in bodies of water when dead organic matter falls into them and sinks to the bottom. Methane has formed in lots of lakes around the Arctic and is quite alarming. If you were to be around when one of these bubbles popped you’d better hope you’re not in the process of lighting a match. Animals that die in this African lake become statues through calcification. Because of the presence of huge volumes of sodium bicarbonate, they are mummified. No one really knows how these animals die but their remains look awful creepy. Photographers have been coming here for quite some time. This location is unusually harsh because of the neighboring volcano that spews alkali-rich natrocarbonatites and those end up in the lake through rainwater. This one is a very interesting piece of art. It looks like something straight out of the movie ‘Monster House’ and is quite artistic. This creative piece begins with a vortex at the front and from there, things only get weirder. It is quite unique, to say the least. While no one lives there it still holds value. While most of the time this park is visible during the spring it is completely submerged. Divers can still access it but those who are not in gear are out of luck. It is quite mysterious and very beautiful. I know you’re thinking this is going to be too cheesy but even if you aren’t all romance enthused you may still like this one. It is a section of industrial railway that has turned into a leafy tunnel. It looks like something straight out of Alice in Wonderland and I LOVE it. It is so perfect and magical. This lake is full of jellyfish. I know, that sounds terrifying but you should know these jellyfish are harmless. You can swim with them all you want. This waterfall literally looks like it is bleeding. This is entirely too creepy and for some hard to look at. This water is red because of the enormous amount of iron in it. This is a waterfall that has a flame right inside of it. This flame you would think would burn out from the water surrounding it but it does not. The natural gasses fueling it keep it going all the time. This is on the Huashan Mountain. If you make your way to the top you will find nothing but a single tea house. It is a plank walk up and is quite terrifying, to say the least. This is very strange and yet also exciting. If you fall, you die. You can clearly see the difference in color between these two rivers. While they touch they never mix. This is because of the difference in density. It is quite a sight to see. This seems to be a normal forest until you look a bit deeper. most of the trees are curved and no one knows why. It is very eerie and gives off a strange vibe but worth the trip. Well, this is basically a huge salt lake and may look normal but is not. It is so full of salt that even if you cannot swim you will without a doubt float. It is pretty unique in itself but I am sure tastes far too salty for me. The sand at this beach is really pastel pink in color. This is due to the presence of certain minerals and plankton. I believe it is something many people find to be captivating. This is two pieces of stone standing but cut straight down the middle. While the idea of it may not sound that cool the sight itself is spectacular. They are HUGE and thought-provoking. How did it get this way? No one knows! This cave is full of squares and rectangles. It looks as if something from another world. You won’t find very many circles in this cave but otherwise, I guess it would be one of the most normal things in this list. Does normal even exist?